TRONDHEIM, Norway, May 15, 2014 (ENS) – Anyone concerned that electric cars produce dangerous magnetic fields can relax. The most comprehensive study ever carried out in this field shows values far below safe exposure levels set by the International Commission on Non-Ionizing Radiation Protection. 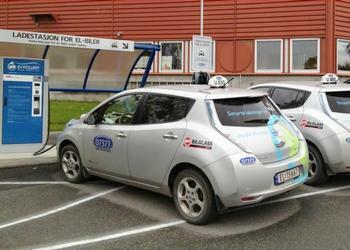 Scientists from seven countries participating in the EU-funded EM Safety research project concluded that drivers and passengers can feel as safe in electric-powered cars as in those powered by hydrogen, gasoline or diesel. None of them exposes people to higher electromagnetic fields than those recommended by international standards. In fact, say the researchers, field intensity is well below the recommended value. The largest independent research organization in Scandinavia, SINTEF, based in Trondheim, led and participated in the EU-funded research project. Contributors to the research included nine other European companies and research institutes – 10 in all. The seven countries involved in the project were represented by universities, the auto industry, research institutions and laboratories. The goals of this research project were to create a standardized method for measuring electromagnetic fields in electric vehicles and to improve the public’s confidence when it comes to magnetic fields in electric cars. The limiting values of acceptable exposure to magnetic fields at different frequencies are set by the International Commission on Non-Ionizing Radiation Protection (ICNIRP). Eight different electric vehicles, including full electric vehicles, hybrid, plug-in hybrid and fuel cell vehicles, two conventional gasoline cars and one diesel car were used to study the level of the magnetic field inside these cars, to determine whether or not they approach the recommended limiting values for human exposure. A mannequin with sensors in the head, chest and feet was used to achieve standardized and comparable measurement results. During the study, the measurements were carried out using real cars in a laboratory and during road tests. The highest values in electric cars were measured near the floor, close to the battery itself and when starting the cars. In all cases, exposure to magnetic fields in electric cars was lower than 20 percent of the limiting value recommended by the ICNIRP. Measurements taken at head-height were less than two percent of the same limiting value. In the case of petrol and diesel-powered cars, exposure was measured at around 10 percent of the limiting value. The study shows there is little difference between electric cars and petrol and diesel cars. The scientists concluded that magnetic fields in electric cars are well below the limiting values, and that there is a good safety margin. The most consistent effects of exposure to electromagnetic fields at low frequencies, up to 100 Hz, are the appearance of visual phosphenes resulting from electro-stimulation of the retina, and a minor reduction in heart rate during or immediately after exposure. There is no evidence that these transient effects are associated with any long-term health risk. Other effects that have been reported include headaches and nausea. A wide range of long-term health effects have been linked to electromagnetic field exposure, but the data are generally sparse and often contradictory, the EM Safety project scientists said. The evidence for these claimed effects is considered by ICNIRP to be too weak and/or incomplete to justify the specification of corresponding exposure limits. Based on the measurements and on extensive simulation work, the project scientists agreed design guidelines to, if necessary, minimize the magnetic field in electric vehicles. The central solution was locating cables, motors and batteries as far away from the passenger cabin as possible. The EU-funded EM Safety research project is the most comprehensive study yet carried out to identify different sources of magnetic fields in electric cars.